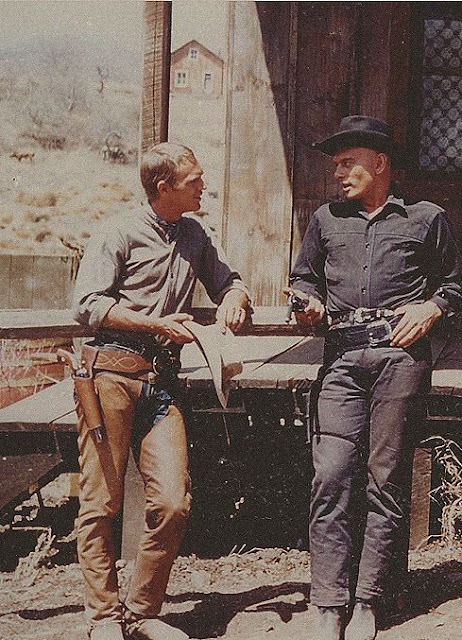 Wasn't Steve McQueen's side arm known as a "Mare's Leg?" It was in the TV series "Wanted, Dead or Alive" but what he's wearing here isn't it. The Mare's Leg was a cut-down lever action rifle. I believe thats Yule Brenner next to him. I know I didnt spell it right but it sure sounds right. Yule Brenner gave up his american citizenship and now hides his head in Switzerland. Yep. What a tough guy. TOXIC MASCULINITY GOD BLESS THEM.